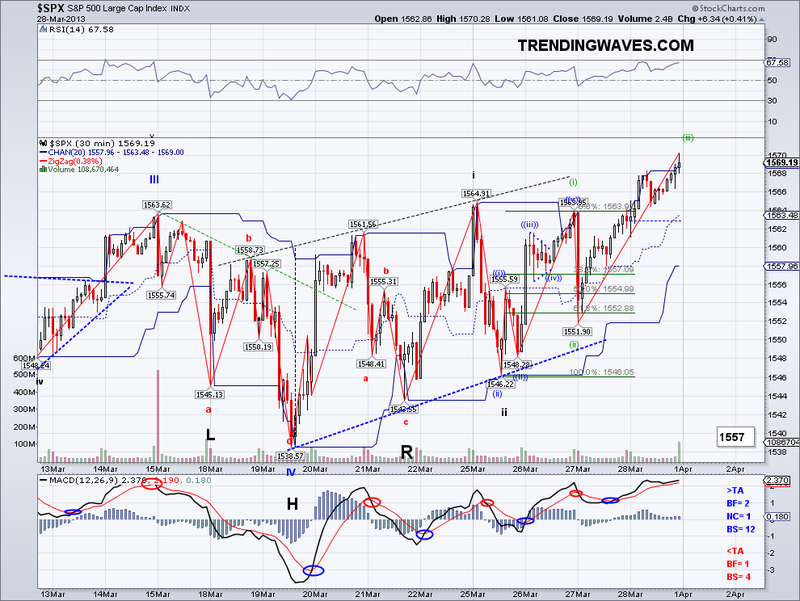 Today's rally confirms my speculation that Monday's high started the Int W5 leg. 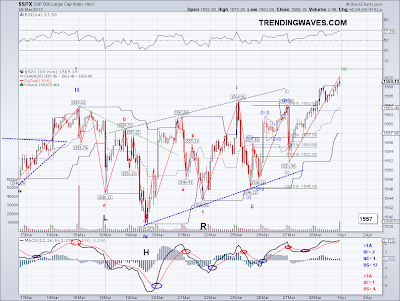 So with that out of the way, all we need to do is add 40 points to the Int W4 low of 1538 and voila! However, the W3 coming out of the range doesn't seem as strong as I had hoped. So unless there isn't a stronger follow through next week, the market might be putting in an Ending Diagonal or a Rising Wedge. Also, I was wrong in assuming there would be stronger short covering so we'll just have to see how the market reacts if 1576 gets taken out. I figured experienced traders (like Doug Kass among others) who have been short for the entire rally this year would have some sort of stop loss at some point and the logical stop would be this range. If we see a strong follow through that ends the current wave from 1551 at around 1580, then this Int W5 will likely reach the 1589 target I have been mentioning since last month and who knows, my 1600 target for 2013 might just be reached with some extra fuel. Whatever the case, this has been one of the best quarters in over a decade and the best thing about this was seeing how using the Trend Average navigated us through uncertainty and all those overbought oscillators (some with multi-year overbought readings). "Regular" technical analysis would have kept the average joe and apparently many professional traders out of the market or worst yet shorting for past 2 months or so. Lastly, I have been working on some calculations that go in tandem with the trend to project waves in early stages. That's why you've seen me project waves in advance more than usual lately as I am basically real time testing. So far, this has helped me improve my trading accuracy. I ended up the day almost flat on my short term margin trade as the SSEC and the HSI sold off last night but today's US strength buffered the fall. But I am keeping my long as I think a bottom is forming in those markets. I am expecting those markets to resume their rallies in Q2 and the US to correct to the 200 day moving average during the same time. So I will be loading on lots of VXX in the 19's hopefully. The market finished the micro 5 wave count yesterday as I expected and today's drop fits into the count I have posting, so we should find out soon if yesterday's wave was a W1. To confirm this, I'd like to see a gap up or bullish wave early tomorrow for a new high or a C leg for a flat and then see the bullish W3 materialize. The higher lows are also good markers for any potential bearish moves. So as long as support holds, the market will break out of the current range. I bought back FXI as per my plan yesterday, so hoping to keep the streak going. 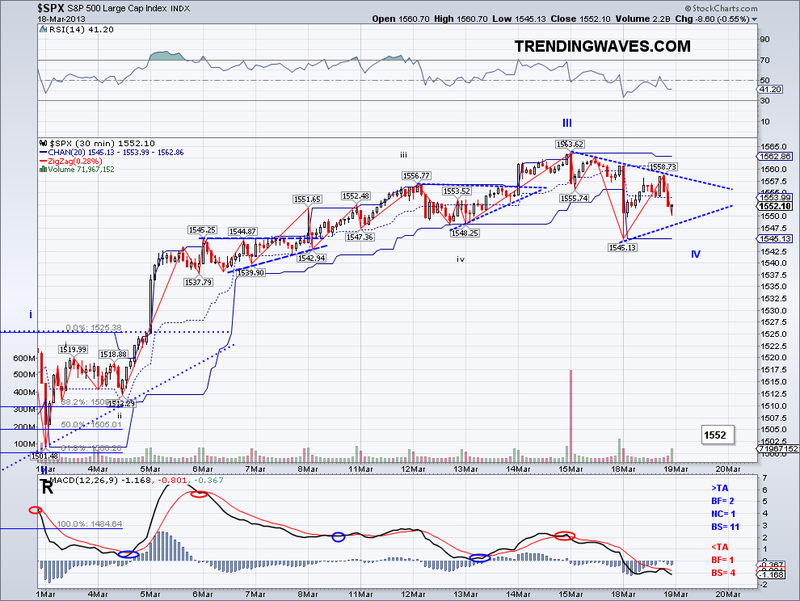 Also, I am hoping to catch VXX in the 19s to short/hedge.. 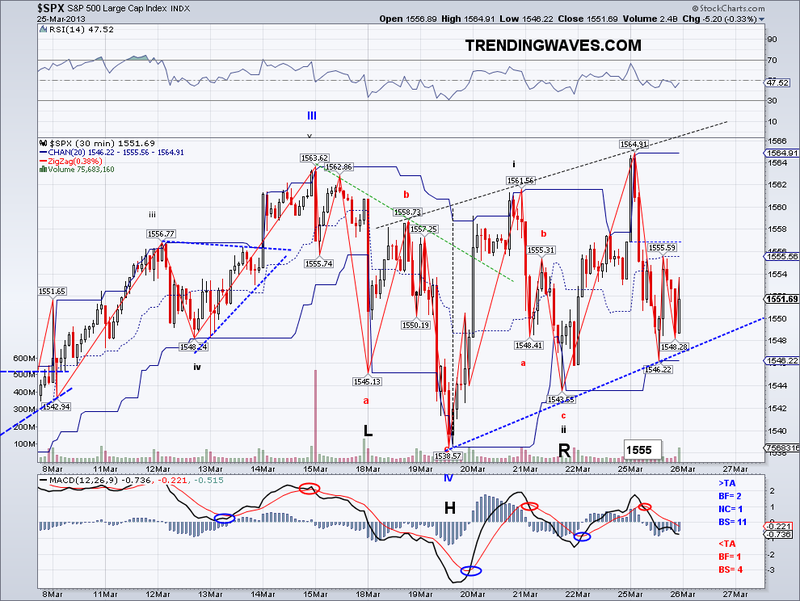 The market gapped up again today but this time there are enough waves to see a 5 count. Going by this micro count, the top today was the end of this micro W1 or W3 of W1. Whatever the case. 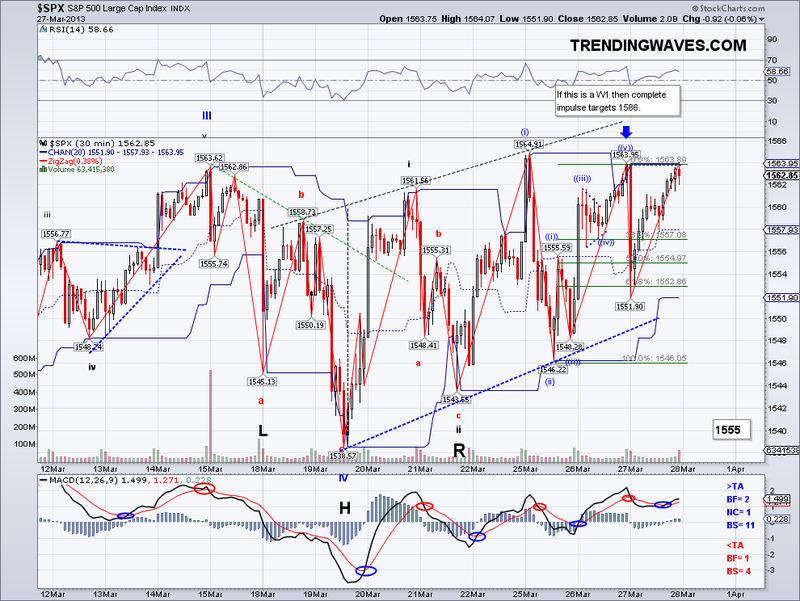 if this is part of an impulse, we should see the all time highs for the SP500 taken out for good. The DOW closed at another all time high again and that supports more upside soon in addition the Trend Average coming back to positive again. When I called for a top couple of weeks ago I expected the TA to be whipsawed and the correction to be shallow, with the 1545-1548 area to be important levels of support. And that level has been tested several times already and it shows buyers are coming in at these dips so if the bears want to make their case, they better do it asap as this is going higher. There is also the possibility of an rising wedge taking place, which also implies higher prices but for now I am following the same count and target for the past couple of weeks. With end of the quarter being this week, I would expect some window dressing by the funds and a short squeeze should the market be able to gap above resistance. I ended up selling the long position from Thursday and I am now 6 for 6 :) Starbucks should be happy. I am going long again if I see key support levels tested again but a test of the Trend Average will be enough for me. If not, I will be shorting through VXX again once I see a complete 5 count which should coincide with the 5 count from 1485.. funny how just couple of months ago so many people were convinced 1476 (the previous high) was not going to be taken out. So the issue with Cyprus is finally out of the way (somewhat) and it seemed like the market was ready to break out this morning as I had been anticipating but I was wrong. The markets did make new 5 year highs but the SP500 found resistance and reversed all its gains. However, the low today is a higher low and as you can see in the chart we have a series of higher highs and higher lows, so technically speaking the bullish wave I have been expecting remains in place until prices go below 1538. Also, we have seen this pattern before and it can turn out to be a nested bullish 1-2 or "3 rising valleys" similar to the one we saw in December before the break out. 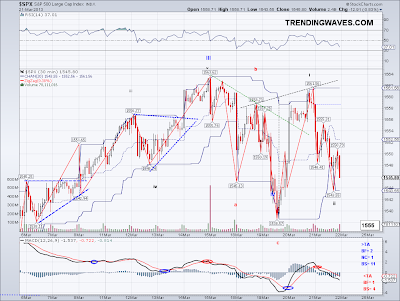 So for the bullish scenario to continue, I'd like to see the market recapture the TA and go from there. Alternatively, the market could be putting in a triangle that will take a few more days to form before breaking out so in this case we should see the market trade sideways. 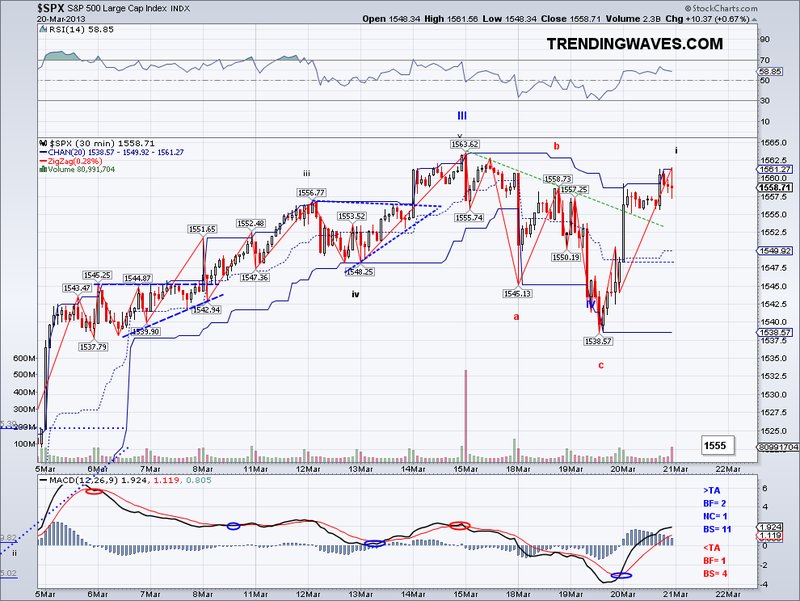 I am still holding long as I don't think the high today was a truncated 5th. We shall see by the end of the week. 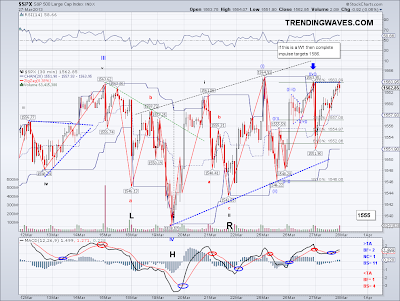 The market has continued the IHS pattern I have been following this week by putting in a somewhat bullish wave and recapturing the Trend Average. And just like I called for a potential top last week, there is a now good chance we might see a breakout out the current trading range and confirm the 1538 as the W4 low on Monday. Once resistance breaks, we should see a short squeeze and see the market trade in the 1580s and I wouldn't be all that surprised to see 1589. Obviously, this bullish scenario depends on what comes out of the Cyprus situation over the weekend. Just like Cyprus was used as an excuse to correct, it can be used as a reason to rally. Now, if we don't see a resolution to Cyprus on Monday, the level to watch will be 1538 as bears need to break support and turn the Trend Average down to make their case. The right shoulder I was expecting for the Inverse Head and Shoulders materialized today and the market closed right at resistance at 1545. So technically, it's make or break time for the market as we should see either a very bullish wave tomorrow or Monday and break the all time high or lose 1538 support and confirm further downside. The close under the TA turns the short term trend back to neutral and some oscillators are starting to roll over and confirm a bigger correction. However, we have this bullish IHS set up that is almost identical to the previous significant top and sellers have the burden of taking out support, so we'll find out soon how this will turn out. Cyprus again is on the headlines and I suspect a some sort of compromise might ignite a rally, so the suspense should be over by the weekend on that. I ended up selling VXX when support was tested for a good profit again and went long FXI at $37.08. I've had 5 consecutive profitable trades so I won't be all that surprised if things don't go my way this time. The set up has been too easy.. so we'll see. * Percentage gain for total liquid portfolio dated September 2012, Goal is to double portfolio for retirement by September 2015, with 100% being the ideal retirement level. Seems like the bullish leg today was a W1, specially since the Dow made a new high. 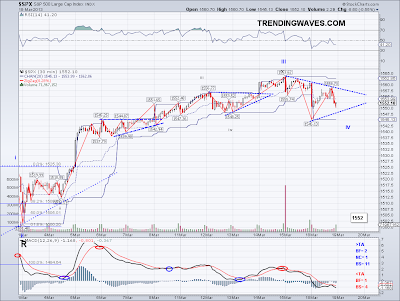 So we could see another Inverted Head and Shoulders like we saw on the last Int W4. In fact, they look identical and it would be too easy if the same scenario repeated itself. But considering there is that 1545-1548 resistance level I mentioned last week and where the first bearish wave put in a bottom. I wouldn't be all that surprised to see that level successfully tested before launching a bullish W3 to break through all time highs for the S&P 500 once and for all. 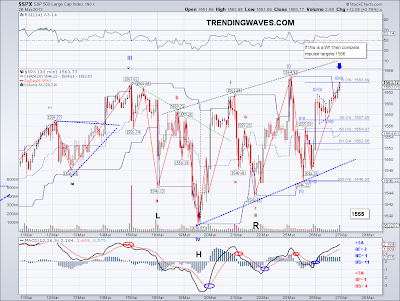 Obviously, the market could do a double ZZ or some sort of sideways correction but new highs seem likely in the near term given the pattern and don't be all that surprised if the market reaches 1589 in the not too distant future for the ideal 5 wave count I have been talking about since February. Today I made twice as much coffee money as Monday, since I made a very profitable error last night. And I bought back the VXX I sold Monday for $20.45 and will be selling hopefully at resistance again and then load back up for the bullish ride.. it would be just too easy if this actually turned out this way but that's what I am seeing. Lastly, the TA is back to bullish today. 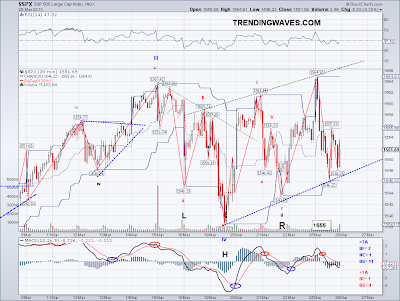 The market did not like the triangle I had in place but instead decided to put in a C wave, so I'll assume the market is doing a ZZ or a double ZZ until we get more clues. Trying to guess correction patterns is really just a shot in the dark, but at least we have the key levels to watch and get an idea of how things might unfold. 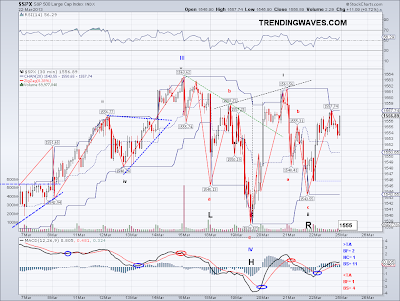 The level I mentioned yesterday for the C wave served as a bottom today at 1538, so let's see if it will hold. 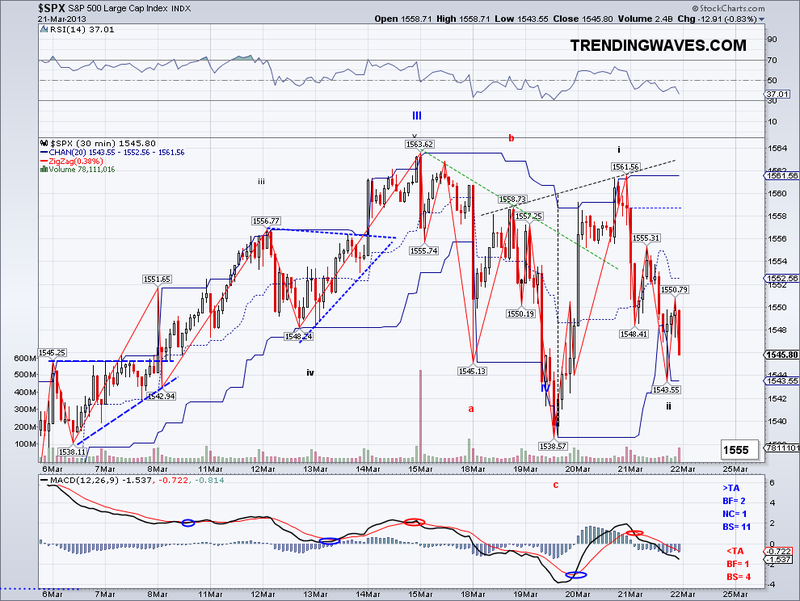 The market bounced off 12 points after hitting that low so that could have been an W1 or an X wave. The TA is at 1553 so it has not turned south yet, but the close below the TA warrants caution so the short term trend is now neutral. Also, since I am assuming this is a Intermediate W4, I am expecting the TA to be whipsawed unless the market launches the W5 rally from here. I ended up buying some FXI to day trade around support but I ended up buying instead of selling (by mistake) in after hours. So I am holding double the amount overnight instead.. hopefully that will turn out well tomorrow. 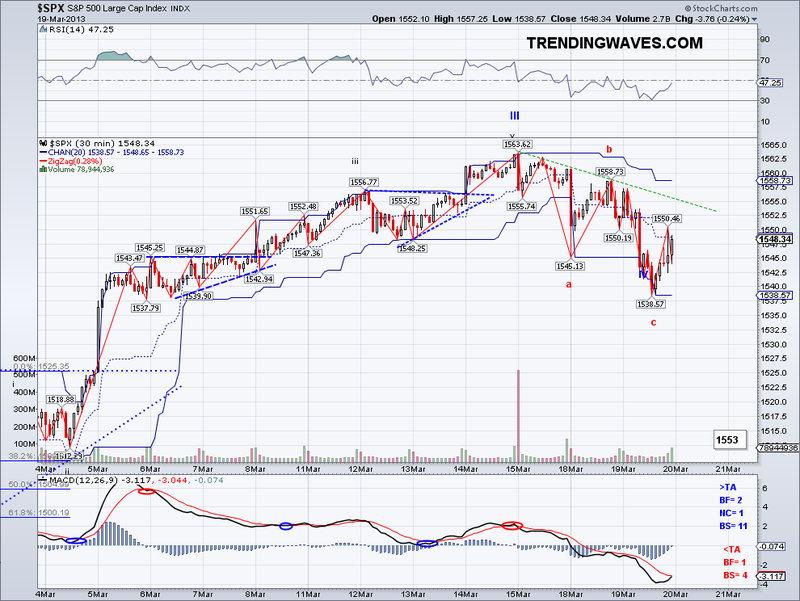 The correction I speculated about last week is now confirmed with today's initial sell off. The excuse as probably most people know by now is Cyprus, a nice little island nation in the Mediterranean Sea divided between Greeks and Turks (demographically that is). I happen to know a little about this Island and the main issue is the tax levy on bank account deposits. The fear is that it will set a precedent for other European nations and cause a bank run, financial panic, etc. But Cyprus is not Spain or Italy, it is a small country with an extremely lenient tax system that welcomes foreign companies and foreign money. Most of the deposits are assumed to be foreign and to have bypassed taxation at some point (similar to the Cayman Islands or the Bahamas for Americans), so when the mainland Europeans agreed to bail them out, they figured it would be ok to tax the accounts considering the money is not from there anyway. But obviously, they didn't see the backlash that they are getting at this point. So now they are debating thresholds for bank accounts to tax given all the worldwide commotion. 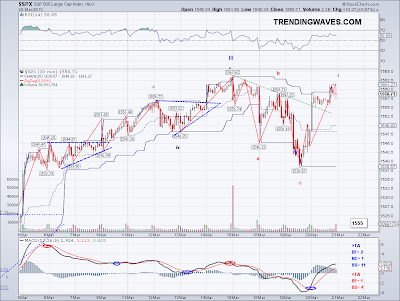 So if the 1545-1548 level holds, then we can expect a nice W5 to reach the ideal target. 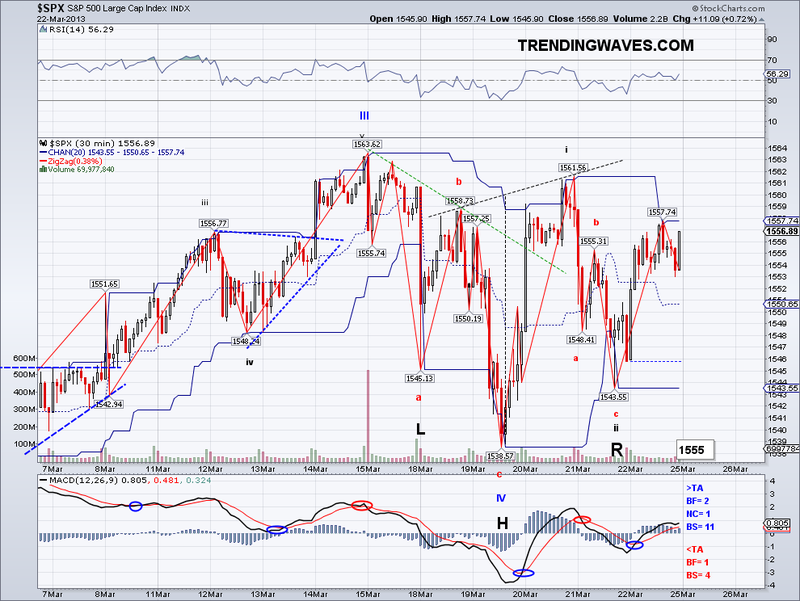 Also, given the fact that W2 was substantial in its retracement, a W4 should not correct as much. So perhaps the correction will start as soon as manana por la manana. Today's low was 1545 so nothing has changed from last week. The ideal would be for the market to triangulate or correct sideways but I can also see the possibility of an C wave that will test the 1538 support level. Additionally, this could be a "quick" W4 that has already bottomed out and is headed towards 1575 as there is a potential Inverted Head and Shoulders in the works. Whatever the case, the market has been able to digest some gains and it is setting itself up for another bullish run. If the market somehow loses the Trend Average and turns it south then I'll start entertaining bearish scenarios. I sold my VXX position at the open, so I was able to squeeze couple of years worth of coffee :) for now I am waiting for next key pivots to short or long. Also, still waiting for China and the HSI to finally bottom. 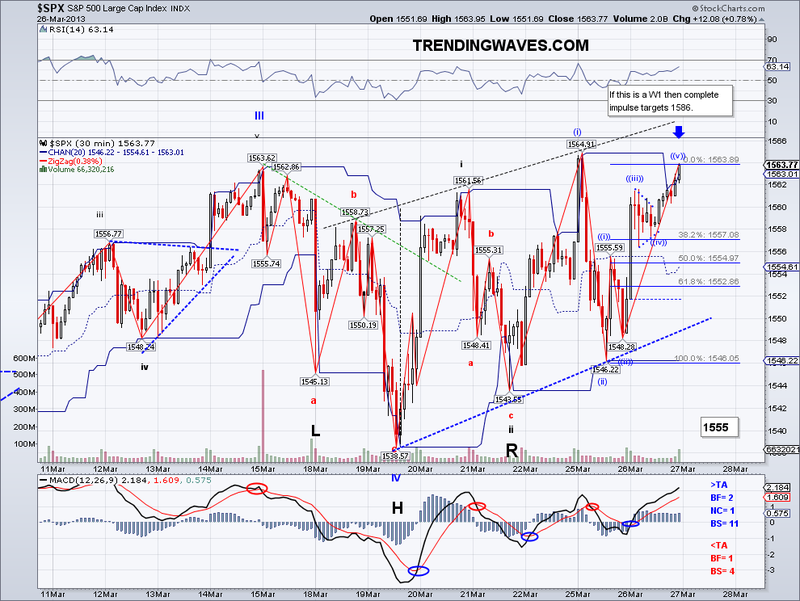 S&P500 to Challenge 1576 Next Week?